Snowmobile, ATV, and boat rentals, sales and service. Sports apparel. 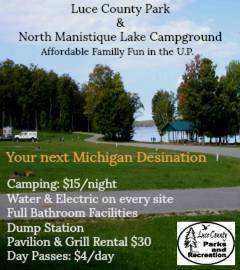 Luce County Campground is located 6 miles north of Curtis on H44/County Road 98 on North Manistique Lake: Open May 1 - November 1. Also in Newberry, Luce County Park and Rec. maintains Ball diamonds, Big Valley Ski Hill, and The Newberry Ice Rink. Eight modern lake view cottages on a private lake. Open year round. Furnished kitchens, satellite TV, and wi-fi internet. Rowboat, canoe and kayak use included with rental. Park your ATV or snowmobile cottage-side and have direct access to the trail systems with food, gas and ATV/snowmobile rentals just down the road. Deluxe continental breakfast, hot tub & sauna, easy access to snowmobile trails, adjacent to golf course, meeting rooms. Snowmobile rentals available. Free High-Speed internet in all rooms. Motel, ATV and Sled Rentals, Hunting Guide service. Now providing wireless internet access.